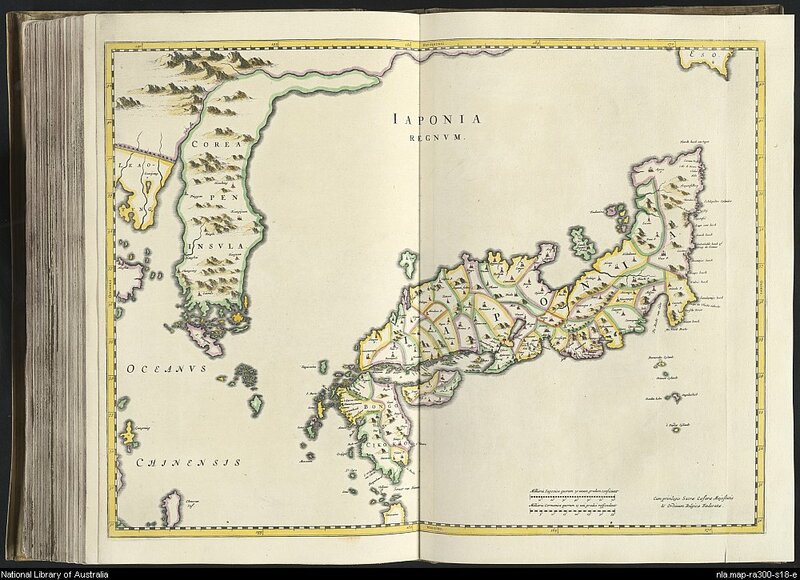 Among early accounts of Korea published in Europe, the first significant one seems to be that by Martino Martini, 1614-1661 in the Novus Atlas Sinensis of 1655. ...Therefor write the Chinese, that, when Taiçungus, Emperor of the tribe Tanga, wanted to guide his heir to Korea, he was forced to make a bridge or a dike of two hundred stadien. *) That is that of Yalu, of which I often have spoken. th' Rumor is with the people of Europe divers and doubtful, to know, if Corea an island, or fixed island is, and not can be sailed on all sides, though some say that they have sailed around the same. This error sprouts out that they think that the big Island Fungma, laying at the south-side of Corea, to be Corea. I, following a Chinese author, who one, to my judgment, may believe better that all the others, makes Corea attached with Niuche in Tartary, and a hanging island in the same way, like it has been painted by the Chinese cartographers, though they do not call it Corea, but Chaosien. Since this name came to us, by the Japanese, with which they call it in general. The Chinese write in this regard, to the Northwest it has as border, the river Yalo, and the rest is surrounded by the sea. This is the district, which the emperor Uúus, founder of the tribe Cheva, to Kicius, kinsman of the emperor of the tribe Xanga, gave the same on loan around the year AD eleven hundred and twenty-one, when the tribe Xanga was exterminated and eradicated, and this by the death of the malicious emperor Kisus, who, conquered by Uúus, burned himself alive, together with the beautiful palace he has made, certainly a suitable death for his lechery, since he has lived scandalous, Under the tribe Cina, it has also had the name Leotung. Hiaovus, of the tribe Hana, forced the king of Korea, who has to receive it in loan, and called it again Chaosien. At th'end of the tribe Cyna, and when the king of the tribe was defeated, he entered Corea, and received, with permission of the king of that country, permission to live in the southern part of the county Civenlo, and this caused that the founder of the tribe Tanga, declared war to the king of Corea, and also conquered the capital Pinyang, after he had superseded the king [of?] Caolien, to whom he gave back however the kingdom, with the order of loan. But when the head of the tribe Tarming, called Hunguus, the tartars fortunately had driven out of China, did the king of Korea, who had suffered also a lot from the tartars, and has been suppressed, send envoys to Hunguvus, to rejoice the victory, and to put himself, like a liege, under the victor, for which cause he was used by the Emperor of China to be given to his lieges. But, what had moved him most to this assumption, was that he understood, that the Japanese, their neighbors, threatened him with war, and here hoped for assistance of the Chinese, which he eventually received. Eventually the kings of Corea were also forced to pay tribute to the Japanese, though with this condition, that, if one king died, the other, who was chosen, always he himself would go to Peking, to stay with the emperor, or send his envoy, to pay his obedience and submissiveness to him. But in my time the king himself has come to the emperor Chungchinius, and makes at Peking, great friendship with our father: by which opportunity some Coreêrs, before having taken the Christian religion, being washed by the water of the holy baptism, under which the head Eunuchus or <gelubde> of the king was, who, by the wish of the king, persisted to accompany our fathers with him to Corea, but because one had a lack of laborers, one couldn't fulfill such godliness requests. The Chinese Author says, that the first king, to whom the kingdom was given in loan, was a villain and of a wrong nature, no royal morality had, and a wicked and altogether a shady man, to follow the Chinese way of speaking following, so that he because of this, by his subjects was murdered in an attack, in his place one of his lieutenant-colonels took the realm, called Ly, who also became a liege and subject of the empire, and made king of the realm of Chaosien, which ever since never stayed behind, And certainly, the Chinese Author speaks the absolute truth here, while the kings of Corea this still render to the Tartarian Emperor, though they in the year sixteen hundred fifty one, in which I came to Europe, abandoned the Tartars, since they were ordered to cut their hair, and dress in the Tartarian way, which was a cause of a great war. The whole hanging island Corea is divided in eight counties, the one lying in the middle, is called Kinki, in which the noble city Pingyang is, where the kings keep their court. Th'eastern county, before called Gueipe, is now called Kiangyuen. The western county is called Hoanchai, and was before actually called Chaosien. Ciuenlo, before Pienhan, in the southern landscape. Kingxan, before Xinhan, lies to the northeast. But the one, which lies to the northwest, is called Pingan. I find no certain and sure number of capitals and cities, though there many are, where in people have been found, since there is a big number of people in this country. All the cities are built in the Chinese way and strengthened. One finds here in the same shape [way] (of) mastery, clothing, language and way of writing as with the Chinese, also the same religions and church doctrines, to know the one who teaches the moving of the souls. They also have the idol Fe. They don't practice Philosophy, and are diligent in their studies. They bury the ones, who died, not before the third year after their death, but they, following the Chinese way, lay them in coffins, which are gracefully, and very tight are closed and keep them thus in their homes. Yes they honor them some days respectfulness, as a sign of obedience and gratitude, as if they have not died yet. They differ almost in the only way from the Chinese, that the women not so carefully are kept at home, yes in such a way, that they also often in the company, and in the meetings with the men appear, and therefor by the Chinese are called immoral by the Chinese, Furthermore, they differ also many of the Chinese in the way of making a marriage. Everybody chooses the one he wants, to be his consort, and engages with the will of both sides, without any supervision by the parents or the family. But by the Chinese things are done completely differently, since only the parents make the marriages and confirm, without the knowledge of the son or daughter, and everybody is kept to take his consort, which has been appointed by his father, and the Chinese consider the ones who do differently, immoral and give as reason that the daughters in this way should be modest, bashful and prude, that, if one would ask them if they wanted to marry, they out of modesty and bashfulness, should say no, that much the Chinese like the show of bashfulness, that they otherwise willing to all kinds of impurities, as long as it happens secretly. The land of Corea is fertile of all kinds of things: it has an abundance of wheat and rice, and this twofold, like Japon, to know the one sown in the water and the one sown on the dry land, like the wheat, which to this kingdom and to Japon, characteristic and particular is and which also exceeds the others, It gives space to earth fruits and wheat and several fruits, which we find in Europe and mainly pears of a good taste. One makes sever kinds of paper, like also in Japon, and precious pencils of wolves-hair, which are used to write by the Chinese and Coreêrs. One finds nowhere better Sandaracha, or this glue, who is gold colored, with which they coat and decorate, like the Japonners, all kinds of home dresses. The root Ginseng is also in abundance here. There are several mountains, which are rich of gold and silver. These people don't have any trade with the foreigners except the Japonners and Chinese, they also fish pearls from the east-sea. The Chinese don't describe many mountains in Corea, the first is the mountain Peyo, which, like they say, lies in the northern part of the county Kingki, and very long and high is. The mountain Vatu is on the northeast. side of the royal capital Pingyang, on which, in the time of the tribe Hana, the king Ing kept his court. Xinciao is a mountain, and Luyang is another mountain near Pingyang, also lies in the northeast. The mountain Hiang is in the county Chungcing. The river Lym, in the county Kingki, washes the capital, and bursts westward in the sea. The river Tatung is in the county Pingan.